Having sensitive teeth can prevent you from enjoying the foods and drinks that you love like ice cream, red wine, and coffee. Before you do anything about it, it’s good to consider what’s causing your pain. With 1 in every 8 people suffering from this, being informed is essential. Fortunately, there are a number of things you can do at home to relieve the pain. Although special tooth-sensitive toothpaste. 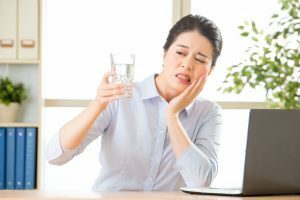 Read on to discover some changes you can make to your routine to ease your tooth sensitivity in Rockledge. But First, What’s Causing Your Discomfort? When your enamel becomes weakened, your dental nerve becomes overstimulated, resulting in sensitivity. If you believe your teeth are sensitive due to tooth decay, infection, or gum disease, see your dentist so they can provide you with proper treatment. Switching out your toothbrush and using a soft-bristled brush can be less abrasive and help prevent aggravating your gums. Brushing your teeth in a gentle back-and-forth motion instead of aggressively can help reduce your sensitivity. Additionally, trying a new specially formulated toothpaste for sensitivity can help rebuild and protect your enamel from weakening more. Avoiding acidic foods like carbonated drinks, coffee, and citrus can help reduce sensitivity. This is because acidic products are known to severely damage your enamel. If you aren’t able to cut soda out altogether, sipping through a straw can help reduce the contact that it has with your teeth. It’s a good idea to avoid brushing after your teeth come in contact with any highly acidic foods. Because your enamel is already weakened, it can cause further damage and sensitivity. Instead, drink milk after you eat or drink these to help to neutralize the acid. If you suffer from bruxism or suspect that you do, you may want to visit your dentist for a custom-fitted nightguard. Grinding and clenching can wear away your enamel and expose your teeth’s nerves. A nightguard will help reduce the impact that grinding has on your enamel. While the above tips are useful, you should definitely contact your emergency dentist in Rockledge if your sensitivity doesn’t improve or only seems to be getting worse. Professional help may be the only solution. Maintaining regular dental visits every six months can prevent your symptoms from worsening. Just because you suffer from tooth sensitivity doesn’t mean you can’t fix it. Drs. Julie Fox offers a passion for dentistry and patient care. For the last couple of years, she has been providing the highest quality of treatment in Tampa Florida. She has also had the opportunity to further her education and teach Advanced Education General Dentistry for the New York University College of Dentistry and Tufts University. Whether you’re seeking same-day emergency care or teeth whitening, Premier Walk-In Dental has got you covered. For any questions or to schedule an appointment, visit their website or contact them at 321-631-4334.